Despite being the first of its kind in the United States, Vassar's Russian Department had only thirty students in 1946, the year Catherine Wolkonsky joined the faculty. By the time she retired in 1961, there were 254. Under her leadership, the Russian department created a course on Advance Translation to prepare students for government work as translators and instituted an annual play designed to train students in pronunciation and confidence in their knowledge of the language. Madame Wolkonsky introduced the root method of teaching to the Vassar Russian department and coauthored two handbooks that redefined the way the Russian language was taught to English speakers. Her first book, A Handbook of Russian Roots, was a collaboration with Marianna Poltoratzky, another respected Russian instructor who later became the chair of the Vassar Russian department when Madame Wolkonsky retired. Wolkonsky received a Vassar Faculty Fellowship for her work on the handbook. Russian scholars consider her second work, A Dictionary of Russian Roots, to be the definitive study of the structure of the Russian language. Born in Petrograd (St. Petersburgh), Russia on July 20, 1895 to General Alexander Olkhin and his wife, Barbara, Madame Catharine Wolkonsky graduated from Tagantzteff Institute, Petrograd, in 1914. During the Russian Civil War of 1917, she served as a nurse with the White Army. At the end of the war, she fled with her remaining family to Belgrade, where she worked as a translator in the American consulate. In Belgrade, 1921, she met and married Boris Wolkonsky. They had one daughter, Marie. In 1925 the family immigrated to the United States. Soon after their arrival in the U.S., the couple divorced. Madame Wolkonsky went to Vermont, where she received a M.A. from Middlebury College. She was also a graduate student at Teachers College, Columbia University, and the Sorbonne, Paris. Before coming to Vassar in 1946, Madame Wolkonsky headed the French Department of Knox Junior College from 1925 to 1942 and then served as a Russian instructor at Cornell. 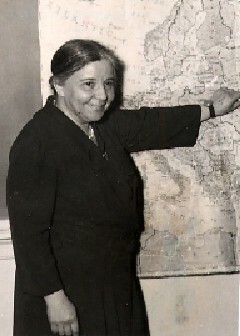 In 1942 she joined the faculty of Connecticut College where she established the Russian department. The same year that Madame Wolkonsky came to Vassar she also started work on the steering committee of the American Council of Learned Societies, which was working on the Anthology of the Russian Character. She published articles in the Russian Pedagogical Review and the Bulletin of the American Association of Teachers of Slavic and East European Languages. Her achievements earned her an honorary degree of Doctor of Humane Letters from the Russian School of Norwich University, Northfield, VT. 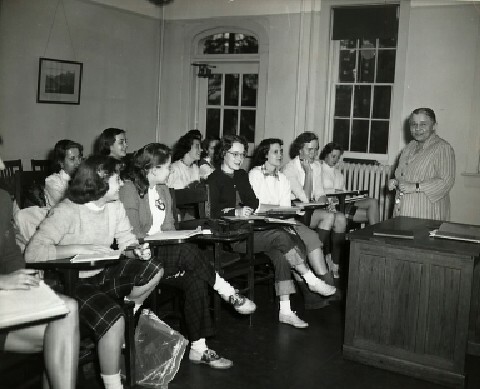 While at Vassar, Madame Wolkonsky also taught courses in methods of teaching at Teachers College, Columbia University, and Middlebury Summer School. She was the first woman vice-president of the American Association of Teachers of Slavic and East European Languages, and she served on the Russian Committee of the College Entrance Examination Board. In 1961, a Vassar rule requiring retirement at age 65 forced Madame Wolkonsky to leave the school, despite a petition signed by thirty six of her colleagues requesting an exception for the Russian department chairman. She retired from Vassar, but not from teaching. Madame Wolkonsky spent the first year of her "retirement" as head of the Reed College Russian department while the chair was on leave. In 1963, she joined the faculty of SUNY Albany, which had a required retirement age of 70 instead of 65. At SUNY Albany, Madame Wolkonsky again drastically increased the Russian department, and when she turned 70, her colleagues again requested that an exception be made. This time, Madame Wolkonsky won her petition, and she was granted seven extensions on retirement, finally leaving SUNY Albany in 1972 at 77 years old. Though finally retired from college work, Madame Wolkonsky continued to teach at the Russian Summer School at Norwich University until 1985. She died in 1992 at 97 years old. Biographical File. Catherine Wolkonsky. Vassar College Special Collections (VCSC).